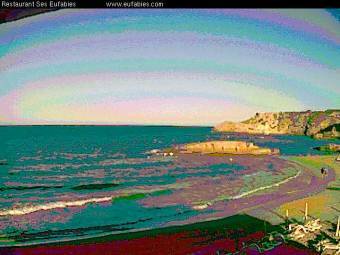 It's 07:06 in Cala Tarida (Ibiza), Spain right now. Beach View A view of the beach of Cala Tarida, Ibiza. Cala Vadella (Ibiza): Livestream Beach and Harbor, 2.1 miles away. Sant Antoni de Portmany (Ibiza): City View, 4.4 miles away. Ibiza Town: View over Ibiza Town, 10.5 miles away. Ibiza Town: HD Stream Port, 10.5 miles away. Ibiza Town: Port of Ibiza, 10.5 miles away. Santa Eulària (Ibiza): Beach of Santa Eulària, 16.1 miles away. La Savina (Formentera): Estany des Peix Lagoon, 17.4 miles away. Es Canar (Ibiza): Playa Es Canar, 18.6 miles away.